ISTE shares a common goal with a host of education membership associations: transforming education for students across the globe. Let’s work together to make it happen. Connect your organization to our worldwide network of like-minded leaders with an ISTE affiliate membership. Becoming an ISTE affiliate opens the door to invaluable networking, partnership and collaboration opportunities. Working together, ISTE and our affiliates strive for organizational excellence to increase the impact on our communities, provide leadership and professional learning for our members, and advocate on behalf of educators. Explore the ISTE affiliate directory to learn about each affiliate. Through our affiliates, ISTE reaches 100,000+ educators worldwide. Being an ISTE affiliate gives AzTEA instant credibility with our members and throughout the ISTE community. We’ve focused our PD efforts around the 2016 ISTE Student Standards and appreciate the support and collaboration ISTE has provided. 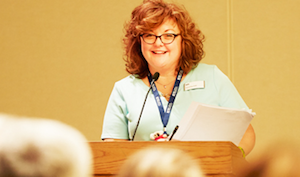 Premier affiliates are those who wish to actively collaborate with ISTE and other affiliates on mission-driven initiatives, professional learning, marketing or organizational growth endeavors. Premier affiliates receive a robust menu of benefits and are offered collaborative opportunities not extended to associate affiliates. 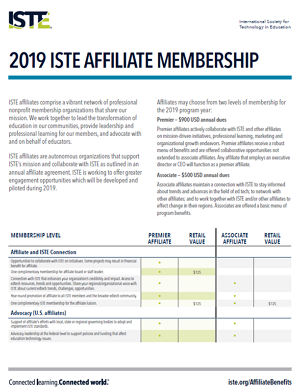 Associate affiliates maintain a connection with ISTE to share information and resources with their members, but don’t actively participate in collaborative opportunities. Associate affiliates can participate in the affiliate community and receive a limited menu of program benefits. To learn more about the affiliate program, please contact affiliates@iste.org.